As Rosetta sped away from its second Earth flyby, it looked back to capture this photo of the Moon, on November 14, 2007 at 06:36 UTC, right about the time that VF189 was at its closest approach to Earth. 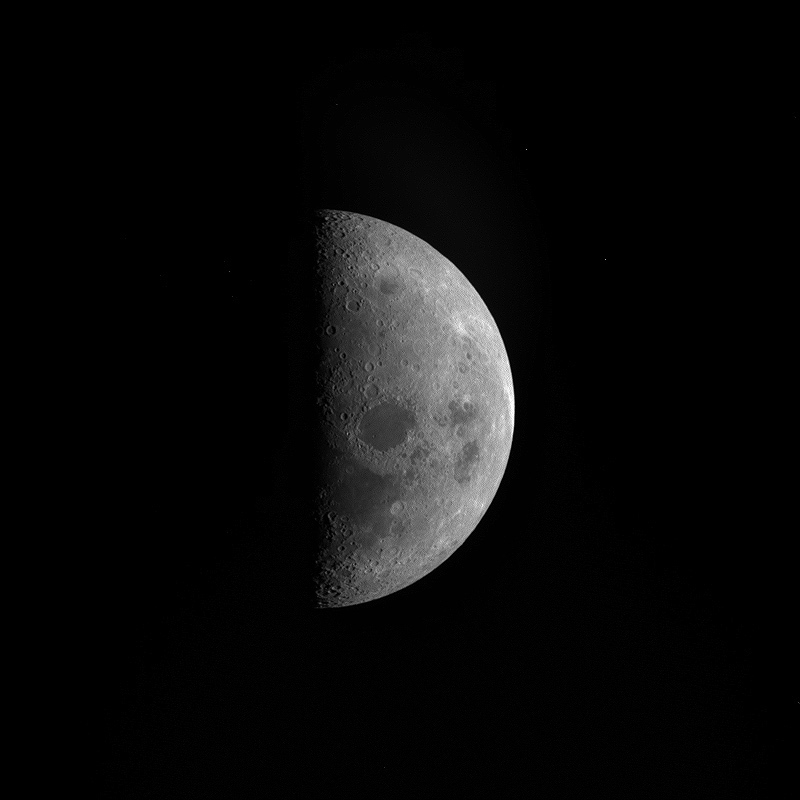 The OSIRIS narrow-angle camera, which took this image, was designed to study much fainter targets than the Moon, so the image was taken through a neutral density filter, reducing the camera's sensitivity by a factor of 50. I think the minor planets community felt a little burned last week by a few news reports that utterly missed the good news in the "2007 VN84" mistake -- which is that several sky surveys were able to "discover" as tiny an object as a spacecraft on a path that brought it close to Earth -- so they were cautious when it came to 2007 VF189. VN84 turned out to be manmade -- could VF189, which was appearing so close to its path, be related to the Rosetta mission somehow. When spacecraft are placed onto interplanetary paths, their final launch vehicle stages are usually following them. In fact, for spacecraft launched on Mars trajectories, their launches are intentionally aimed to miss Mars entirely to make sure that the final launch stage, which is not sterile, does not wind up on a trajectory that will crash into Mars. And New Horizons is being followed to Pluto and beyond by its dead Star 28 upper-stage booster. However, Rosetta is neither a Pluto flyby nor a Mars mission; its trajectory is complex, it has already flown by Earth and Mars once each, and to set up for these flybys it has performed several long burns of its thrusters. No part of Rosetta's launch vehicle would be performing those burns, so VF189 cannot be a part of the launch vehicle. Alternatively, then, maybe something fell off the spacecraft? I think we would know if that were the case; and anyway since the mass of the spacecraft is one of the most important inputs to the calculations of all these gravity assists and trajectory correction burns, ESA sure would know if Rosetta were missing some mass. One clue that 2007 VF189 is indeed a rock and not a spacecraft is that although Rosetta and VF189 flew past Earth within hours of each other along strikingly similar trajectories, tiny trajectory differences can turn into major orbital differences over time and space. For example, both objects had a recent encounter with Mars (Rosetta had a Mars flyby on February 25), but VF189's Mars encounter was fully five weeks later. That suggests that the close approach of VF189 to Rosetta just coincidentally happened while both were in a close approach to Earth. In fact, further investigation of the orbits showed that that was the case. Another obvious question at the end of all this is: why not take a photo of this mysterious object with Rosetta? Well, one man's "close" is another man's "far." These two objects are "close" in terms of solar system distances -- only 0.01 AU apart -- but quite "far" from each other when it comes to snapping photos; VF189 would be far too faint for even Rosetta's sensitive cameras to spot. The angle-in-the-sky difference between the two objects on their inbound trajectory is about 14 degrees, or around 0.24 radian. The area enclosed in a circle of 0.24 radian radius is 0.18 sterradian, so the probability that a random object will be that close in the sky to another object is 0.18/(4*pi) = 0.014, or about 1 in 70. From my population and impact frequency analysis (currently a NASA report, I'll publish it eventually), an object of absolute magnitude H=28.4 or larger hits the Earth about once in 6 years. VF189 will miss by about 37 Earth radii. So the frequency with which one comes that close or closer is (37^2)/6 = 230 times a year. Actually, gravitational focusing increases impact probability over that of the Earth's physical cross section, by a factor of about 1.5, so the corrected frequency of an encounter at 37 radii is about 150 per year. So such objects are not rare at all. The difference in time between closest approaches of Rosetta and VF189 is about 0.27 days. So the probability that a rock would chance to come that close, that close in time, to Rosetta is 0.27*150/365, or about 1 in 10. Finally, the approach velocity at a distance is about 9.4 km/sec for Rosetta and 11.5 km/sec for VF189. That's a difference of 2.1 km/sec, really much bigger than I had anticipated. Anyway, 2.1 km/sec is about 10% of the mean dispersion of approach velocities of potentially hazardous asteroids (around 20 km/sec), so the chance that it would fall within 2.1 km/sec is around 1 in 10. That's not very likely -- about equal to the chance of a Tunguska-sized impact occurring on land in the next year, but it is not absurdly unlikely either. In brief: the probability for there to be a random object so close in the sky to Rosetta is 1 in 70; the probability for Rosetta and this object to come close to Earth within 6 hours of each other is 1 in 10; and the probability that they would have velocities within 2.1 km/sec of each other is 1 in 10. Multiplying those together, you get a 1 in 7000 chance for Rosetta and another object to pass so close to each other, at nearly the same speed, near Earth. That's an interesting number, because it's not too likely, but neither is it vanishingly unlikely. Plenty of people bet lots of money on worse odds. In the end, then, 2007 VF189 is a small, unremarkable Apollo-class object (meaning it's an Earth-orbit-crossing asteroid with an orbital period of longer than one year), and nobody would have paid much attention to it if not for last week's mixup.